The SJRA constructed a 30 million gallon per day membrane water treatment plant on the Lake Conroe dam. 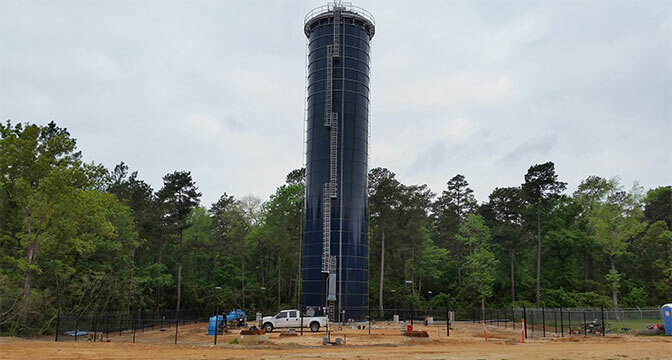 In cooperation with a partner team, performed constructability design review and construction management of over 16 miles of transmission piping (12 inch to 60 inch diameter) and 10 water receiving facilities around the City of Conroe and Montgomery County. Construction included a 125 foot tall standpipe for system pressure maintenance. Supported completion of seven additional receiving facilities and large diameter transmission pipes along McCaleb road and Fishcreek Thoroughfare. Managed startup activities for six major clients receiving the surface water.